This is a very quick and easy dish to make, if a little extravagant. You will need 150g white crabmeat, which you should get from 4 small (125g), dressed Cromer crabs. Use the brown meat in other dishes. Make the breadcrumbs by putting slices of stale bread in a low oven until dry, then whizzing them in a food processor to fine crumbs. These can be kept frozen until needed. Using your hands, squeeze as much liquid as you can from the crabmeat. Then pick through to check that there are no hidden pieces of shell. Put in a mixing bowl. Finely dice half the red pepper and finely slice 2 spring onions. 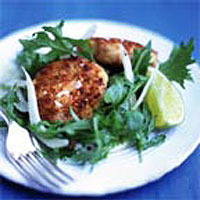 Mix into the crabmeat with the mayonnaise and grated lime zest. Season to taste with lime juice, salt, freshly ground black pepper and cayenne pepper. Spread the breadcrumbs on a plate. Divide the crab into 4 portions and gently shape each into a patty before coating in the breadcrumbs, gently pressing the crumbs on to each cake. Transfer to a clean plate and chill, covered, while you make the salad - or until needed. Make the salad by finely slicing the remaining half pepper and spring onions. Put in a mixing bowl with the sliced fennel and salad leaves. Whisk the mustard with the crushed garlic, vinegar and extra virgin olive oil. Season to taste. When you are ready to serve, heat 3 tbsp olive oil in a frying pan over a medium-high heat. Once hot, add the crab cakes and fry for about 2 minutes before gently turning over and frying for a further 2 minutes or until golden and slightly crisp. Toss the salad ingredients in the whisked vinaigrette and divide between 2 plates. Add the hot cakes, garnish with lime wedges and serve immediately.